This is a Single Head Positive Displacement Gear Pump Filler, or can be fitted with an optional Piston Pump for use from a table, counter top, or other such stable surface. This new entry level filler will satisfy your need for a relatively low volume, low cost , user friendly, high quality filling machine. 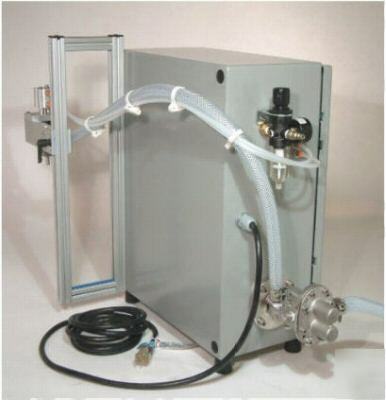 Equipped with the gear pump, the advantage over a typical piston filler is that you can fill a wider range of container sizes with programmable control of pump gear revolutions. 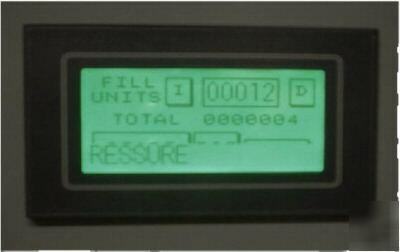 In addition, the unit comes equipped with a variable speed motor, giving you even more control over the output of your filling operation. Liquid product can be filled from its source, such as a mixing tank or storage resevoir, simply by inserting flexible intake tube directly into product. 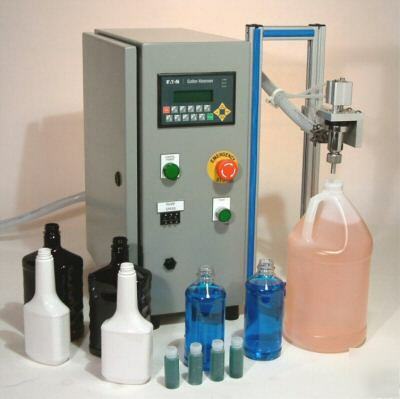 Liquid product is then drawn into the machine as needed, and pumped into containers to be filled. Available with a variety of accessories and options, including automatic bottle indexing, product level control, product reservoir, and more. Please email us to learn more. Electrical - 120VAC/60Hz single phase 15 amps. This Filling Machine is BUILT TO ORDER!! Foods, Chemicals, Cleansers, Polishes, Oils, etc. Products with solids such as salsas or other food products, products with visually decorative particles, or products with chunks or globules such as shampoos or conditioners with suspended soluble solids. For container sizes larger than 64 ounces, we’ll need no less than 5 gallons of your product, with at least 6 bottles/containers. After testing is complete, regardless of results, all materials and product will be returned to you at your request and expense. This is the unit you need to get your new enterprise up and running, and get your great new liquid product out there for the public to purchase, use, and enjoy! * This unit is base priced for start-up operations, but can be built to order and modified for fully automated filling line systems. Please feel free to contact us about how we can serve your specific needs. Proudly Designed & Manufactured in the United States of America! !